Mather & Roberts Butchers together with the premises of Richard Mather coal merchant, Main Road, Meliden (today known as Ffordd Talargoch). 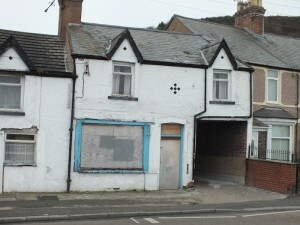 There is only one main street in the village which the few shops were located. 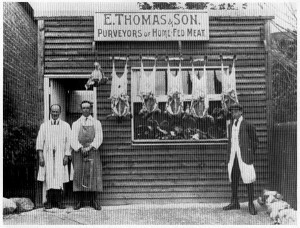 In 1919 the butcher was Edward Thomas (right of Doorway) and his assistant was Jack Thomas (left). 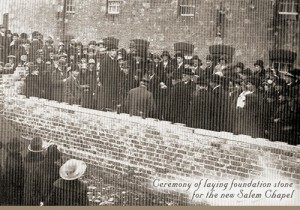 The errand boy was George Edward Williams (right of window). 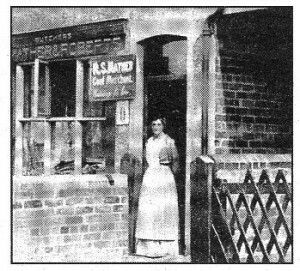 This little wooden shop later became an Electrical store. 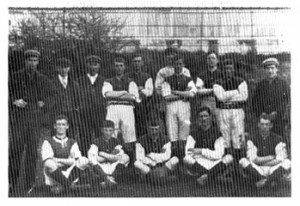 The picture was taken below the main road, just south of the Grove – long before that road and the council houses were even contemplated. in the background the extensive and continuous glass conservatories of the cottages adjacent to the Star Inn are visible. These were removed as recently as 1936 and were a most unusual feature.